What now for Honda’s 2017 Road racing season? Following the qualifying incident on Thursday, Honda was unable to pinpoint the cause of the issue on the SP Fireblade and so withdrew from the Superbike and Superstock races. 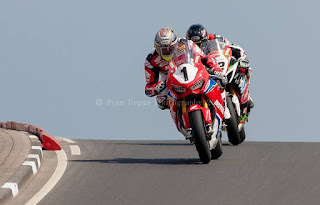 Reports are that John McGuinness stated that the engine didn’t ease off as he rolled off the throttle over Primrose hill, a fact Honda haven’t been able to confirm or deny until the datalogging becomes available. “That means we don’t know exactly what happened to the bike. John said the throttle stuck, or the engine didn’t cut off and we have no way of looking into that until we can get the bike back into the workshop. All is still go for the TT in 2 weeks time, all we wonder now is the team lineup.